Two major trends underpin Mr Kerry’s efforts – and for many analysts they make an Israel-Palestinian peace more important now than ever. One trend is the growing belief in many quarters – you hear it explicitly from British Foreign Secretary William Hague – that the opportunity for a “two-state” solution, a Palestinian state in the West Bank and Gaza Strip living alongside Israel, is fast running out. 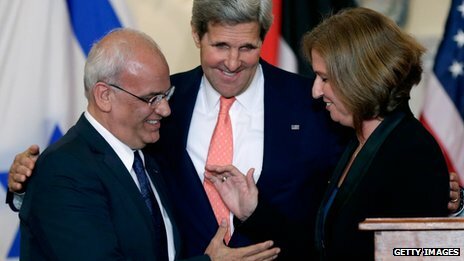 “The window for a two-state solution is closing,” Mr Hague noted in December last year. According to this view the occupation risks becoming permanent, raising profound questions about the nature of Israel’s democracy and for the way the country is viewed abroad, especially in the West. The other trend is the chaos and uncertainty ushered in by what used to be called the “Arab Spring”. Popular upheavals have degenerated into military take-over, near anarchy, full-scale civil war and the renewal of bitter sectarian violence. The crisis in Syria has called into question the very borders of some of the states established in the wake of the departure of the colonial powers after World War II. It is clear that these processes are profound and will unfold over a considerable time period. It is not so much that an Israel-Palestinian peace will solve any of these problems. It will not. It won’t even contribute to resolving them. But Western diplomats believe that a resolution to one of the world’s most intractable disputes could lance a diplomatic boil that inflames passions and tensions way beyond the Middle East and contributes to making a very bad regional situation even worse.